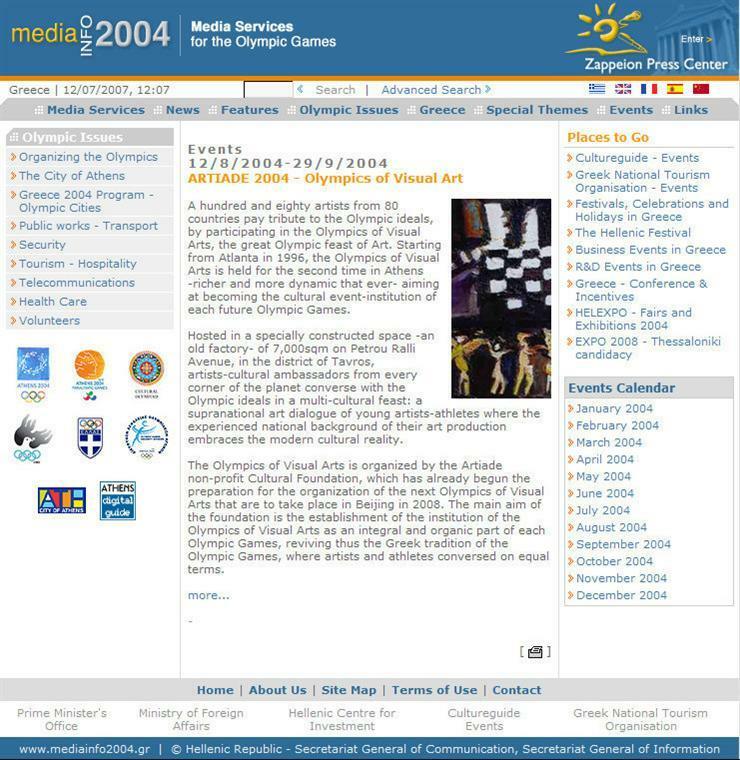 ARTIADE II was carried out at the Gazi Cultural Center in Athens, close to the Olympic Stadium at Petrorali Street, from August 12 to September 25, 2004, and was very much larger than the first ARTIADE in Atlanta. 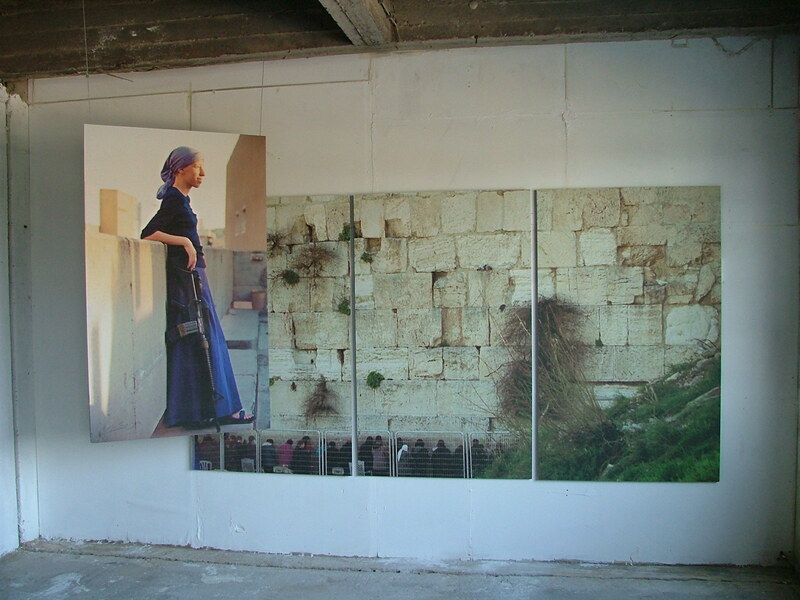 Many thousands of artists applied for admission to the ARTIADE 2004, and 2,500 artists were preselected. 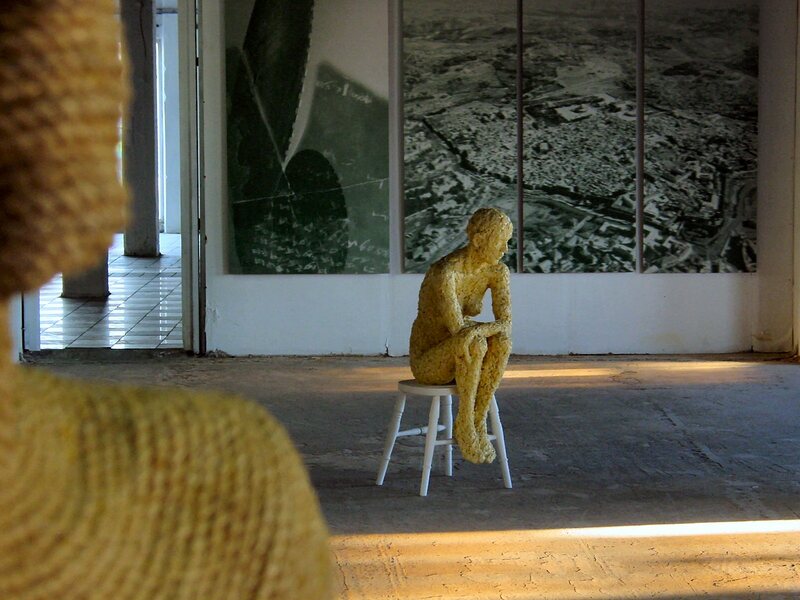 In the end, 173 artists were chosen from 80 countries to show their works at the ARTIADE in Athens. There was a magnificent media interest. Many visitors and prominent figures attended this unique art event. 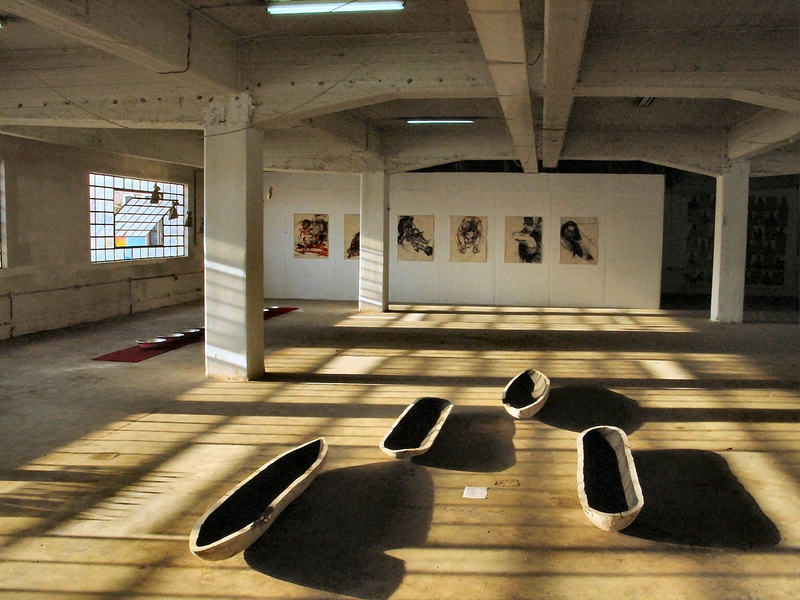 The exhibition hall was a former ceramic flagstone factory and was specially renovated by the ARTIADE Foundation for this art venue. 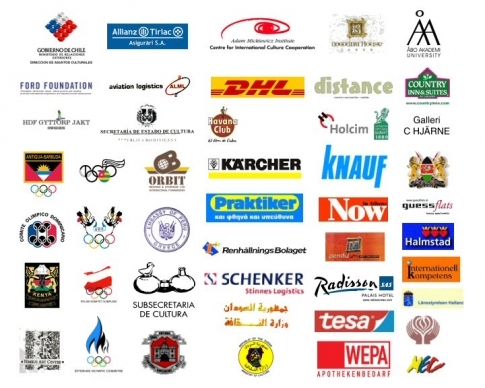 The exhibition was presented on a total area of 4,000 square meters. There was also a large outdoor area where oversized sculptures were shown. A separate area for video art was set up as well. 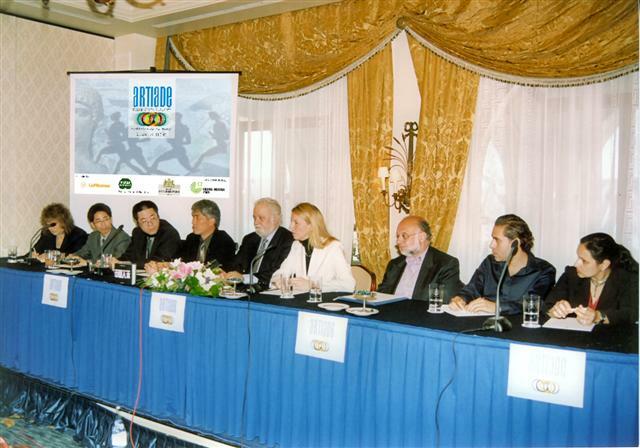 Before the the grand opening reception, a jury meeting for the ARTIADE was held. The German Goethe Institute provided suitable premises for the selection of the artists. This was followed by a press at the 5-star Grand Bretagne Hotel in Athens. Tereza de Arruda (Brazil), curator and art historian, curator at the Documenta 11 as well as former curator of Goethe Institut Internations, Prof. Monné Bou, curator, lecturer at the Art Academy of Abidjan (Ivory Coast), Ambassador Dr. Delfín Colomé, Director of ASEF (Asia-Europe-Foundation), Hamad Khalaf (Kuwait), artist Artiade Atlanta, Spyros Mercouris (Greece), curator, producer, director of documentary films, honorary President of the “Cultural Capitals and Cultural Months of Europe,” Prof. Wang Huang Sheng, Director of the CAFA-Central Academy of Fine Arts (P.R. China), Renate Westhoff (Germany), curator, Founder of the ARTIADE and president of the foundation ARTIADE NGO. 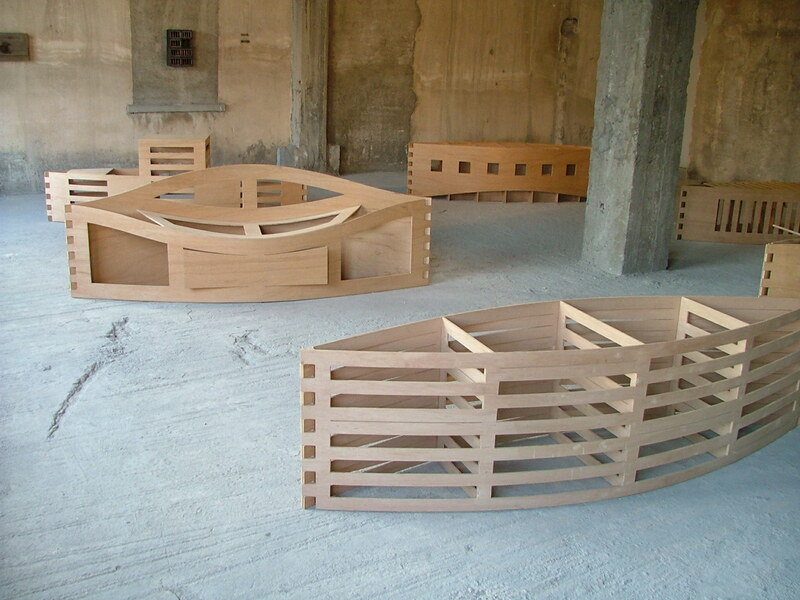 The Artiade Foundation worked closely, among others, with the ASIA-EUROPE Foundation. This was due to the fact that at the Asia-Europe Summit – Conference 4 (ASEM) in Copenhagen on September 4, 2002 chaired by Romano Prodi, the President of the EU-Commission, the ARTIADE was described as a fine example for the promotion of cultural exchange and comprehension between nations and cultures. All of the ASEM members agreed with the chairman‘s proposal that there should be a collaboration between the ASEM and the ARTIADE Foundation. As a result, we worked together with the ASEF (ASIA-EUROPE-FOUNDATION of the ASEM countries), and their Executive Director at that time, Ambassador Dr. Delfine Colome, who was also a member of the ARTIADE jury in Athens in 2004. The Asia-Europe Foundation (ASEF) was introduced to this project thanks to support from the ASEM IV Summit held in Copenhagen from September 22-24, 2002. ASEF believes that this project is worthy of support in view of its effect on the promotion of cultural exchange and mutual understanding across national boundaries. I have the pleasure to inform you that ASEF management is very interested to cooperate with your organization in the said event, as the event fits very well with ASEF mandate to promote exchange and dialogue among the civil societies in Asia and Europe. It also reflects ASEF commitment to the ASEM Process, given that the said event has been specifically listed in the report of 2002 ASEM Summit in Copenhagen.